MOCOA, Colombia — Search teams were still digging and probing into dense piles of mud and debris Monday, refusing to give up the search for survivors of the deadliest floods in the recent history of this Colombian city. On Monday night, three days after floodwaters rushed through the city of Mocoa, president Juan Manuel Santos said the official death toll had increased to 273. Earlier, Colombian authorities were checking for any report of movement that could be a sign of life. They were not yet ready to give up on the more than 200 people who remained missing. An aerial view shows a flooded area after heavy rains caused several rivers to overflow, pushing sediment and rocks into buildings and roads in Mocoa, Colombia April 1, 2017. Cesar Carrion/Colombian Presidency/Handout via Reuters ATTENTION EDITORS - THIS IMAGE WAS PROVIDED BY A THIRD PARTY. EDITORIAL USE ONLY. Colombia's President Juan Manuel Santos (L) gestures while visiting a flooded area after heavy rains caused several rivers to overflow, pushing sediment and rocks into buildings and roads in Mocoa, Colombia April 1, 2017. Cesar Carrion/Colombian Presidency/Handout via Reuters ATTENTION EDITORS - THIS IMAGE WAS PROVIDED BY A THIRD PARTY. EDITORIAL USE ONLY. Colombia's President Juan Manuel Santos (4th R) gestures while visiting a flooded area after heavy rains caused several rivers to overflow, pushing sediment and rocks into buildings and roads in Mocoa, Colombia April 1, 2017. Cesar Carrion/Colombian Presidency/Handout via Reuters ATTENTION EDITORS - THIS IMAGE WAS PROVIDED BY A THIRD PARTY. EDITORIAL USE ONLY. Colombia's President Juan Manuel Santos overflies a flooded area after heavy rains caused several rivers to overflow, pushing sediment and rocks into buildings and roads in Mocoa, Colombia April 1, 2017. Cesar Carrion/Colombian Presidency/Handout via Reuters ATTENTION EDITORS - THIS IMAGE WAS PROVIDED BY A THIRD PARTY. EDITORIAL USE ONLY. "We do not like to create false expectations but where there is a possibility of life we will do everything possible," said Carlos Ivan Marquez, director of Colombia's National Unit of Disaster and Risk Management. 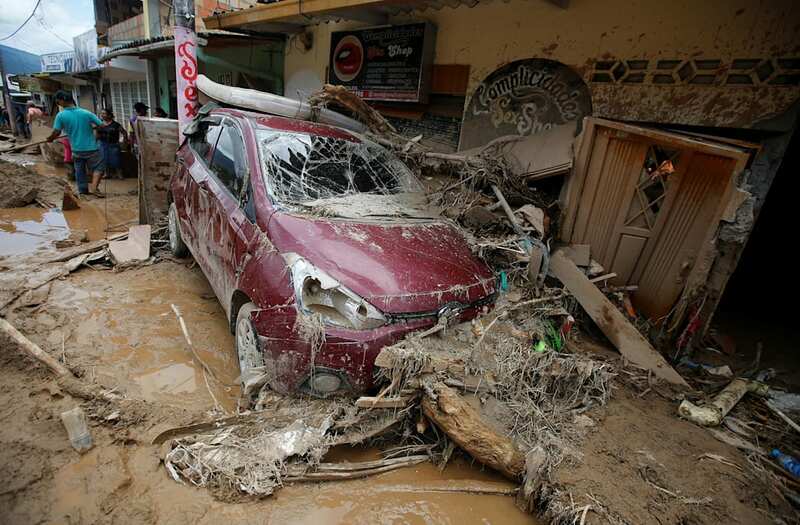 Much of Mocoa was strewn with rocks, tree limbs, debris and brown muck after heavy rain caused at least three rivers of six rivers that surround Mocoa to rise up and surge through the city of 40,000 in southern Colombia Friday night and early Saturday as people slept. Downriver from the city, the remains of one young man, a tattoo of a spider on his ankle, appeared amid boulders and tree branches, discovered by a local farmer who was volunteering in the search for remains. Soldiers and Colombian Red Cross workers arrived shortly to wrap him in plastic and took him to the morgue for identification. Farmer Mario Fernando Melo, wearing a surgical mask as he searched, said it has been a struggle to be surrounded by so many people desperate to find their missing loved ones. "But at least a family will no longer be left with the uncertainty." In Mocoa, people looking for their loved ones walked along the river banks or went back and checked in repeatedly at the hospital, hoping to find answers. The government says it has identified 170 of those killed, publishing a list that included more than 40 children, including infants and toddlers. Marquez said authorities had begun releasing the remains to their families and dozens held funerals at the cemetery in Mocoa. Carlos Valdes, the director of the country's forensic service, said they were working feverishly to identify victims and determine the cause of death, which in most cases was trauma from cascading debris. Manuel Santos and other officials pledged both emergency relief and that Mocoa would be rebuilt, including a new water system to replace the one damaged in the flood and new homes for those in the 17 neighborhoods hit hardest by the surging water. Santos declared an "economic, social and ecological emergency," a designation intended to speed reconstruction efforts. "We are not going to stop until everyone affected by this natural disaster receives help," Marquez said.